Ants are some undesirable elements that trouble every home. Tiny creatures like ants play havoc at home. Initially people often commit the mistake of taking these elements very lightly. However, as their numbers increase the problem becomes grave and then it becomes almost impossible to control them. The biggest insect trouble is certainly caused by ants that run around the house. The sheer numbers of the ants makes it difficult for the people to control them. There are certainly several solutions that have come up for removing ants. One solution, which is very easy to use and even can be termed as homemade is the use of apple cider vinegar. Ants, especially the red ants can be a menace for any home owner. The red ant bite can be very troublesome and itchy. Also, the foodstuffs at home attract the ants. Hence, if the home owners leave any foodstuff open, it is bound to go to waste with the ants feasting on the foodstuffs. Ants make their presence felt in almost every home. The reason is that they can live even in tiny cracks and crevices in the house. There have been several solutions that have sprung up in order to control or eliminate these ants. Ant killing sprays, powders, medicines, pesticides etc is just a few to name. However, all these solutions are poisonous or harmful substances even for the humans and they must be very careful while they use them. These are artificial chemical-based substances. However, some natural or organic solutions can also be used in order to eliminate the ants. Apple cider vinegar is one such solution. Apple cider vinegar is one substance that is found in almost every kitchen. It is a vital ingredient in cooking and is used extensively in many recipes. However, not many know that apple cider vinegar can actually be used for eliminating ants. This is one of the healthiest ways of removing ant trouble. Also it is very easy to use it as a solution for ant removal. The only step includes mixing of apple cider vinegar in water in a 50-50 ratio. This solution can be used to wipe the areas where there is maximum ant trouble in the house. Only a sponge is required for wiping the areas with the solution. All the cracks, crevices, windowsills etc can be easily wiped with this solution of water and apple cider vinegar. Also, if there is excessive trouble of ants, then this solution can be simply spread over the areas. 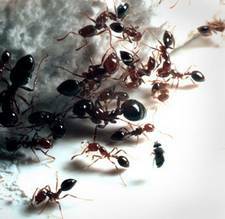 The ants would get eliminated automatically.The biggest advantage is that it poses no problem to the people at home. This is just one of the easy ways in which house hold products can be used for removing ants. Find out how to rid the house of ants and more in How to Get Rid of Ants. Yet another great tip! I had a parade of ants to the kitchen counter just last week. I looked everywhere for a natural remedy but never found this solution. Instead I used coffee grounds – the advice was to lay them out in a thin line around the edges where the ants were coming in. It did work, but very unsightly. we’ve had a small sugar ant problem for about a week here. tried the super-kill spray stuff but this solution is highly effective and kid-safe! kills instantly as well. It truly saved the day! Am so troubled by ants, and can’t wait to try. Will come back to let advise of the results.